Discover How Your Abundance, Incarnation Destiny, Joy, Spiritual Partnerships, Well-Being AND Trust & Faith in God Has Been Hijacked by the Hidden Energetics of the Matrix Along With Immediate Solutions. 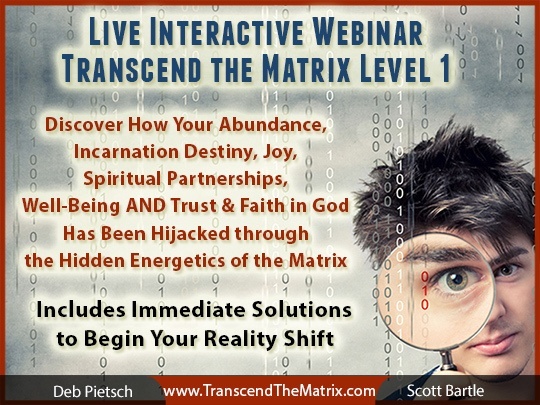 This is the 1st Live Interactive Webinar that Deb and Scott have done in 4+ years! A lot has shifted and we’ve been up-leveled A LOT! Now YOU get to benefit from our “behind the scenes” Activities, Activations, Teaching, Insights, Experiences and Wisdom! You won’t be the same person after this 3+ hour Level 1 webinar plus the 2 experiential tools, “Clearing Your Field 101 and 102” included in this INTRODUCTORY, “we’re coming back online” price! Live Webinar ~ We will disclose details, insights, examples and evidence of NEFARIOUS ENERGETICS mostly likely affecting every aspect of your (daily) life. Learn solutions for many every day issues, receive Activations throughout webinar that will further engage your visceral, alchemical experience from inside to out. If so, would you like to know why this is occurring as a collective experience and HOW YOU CAN IMMEDIATELY BEGIN TO SHIFT YOUR EXPERIENCE - i.e. your entire life? "Humanity's Free Will has been thwarted"
Deb has been provided with thousands of hours of communication that shed light on the hidden energetics of the current timeline / reality. One of the main subjects of focus is the events that took place on 9/11/01. This event was more than what has even been identified even by the “inside job” conversations. She has been given the details of how this event was the final “nail in the coffin” to shift us into an alternate timeline... a “down-trodden” reality that was not meant to be a part of our human collective experience. Through various means, humanity’s Free Will has been thwarted including effectively collapsing the Fields of Light that we are meant to be able to utilize like garden soil for our ability to Create Reality, align with aspects of Law of Attraction, Universal Law and much more. Getting to the Heart of the Matter - YOU - Where Are YOU? Most likely you are in the category of “you don’t know what you don’t know” when it comes to the hidden workings and energetics of the Designed Assault Against Humanity Matrix. This makes it pretty much impossible to shift your experience… THAT CAN ALL CHANGE RIGHT NOW! Please abide by the TTM New Earth Seal of Integrity. Please be conscious of the energetic signature of being out of integrity in sharing this with those who have not purchased this or any of our tools and offerings. Creating a reality of INTEGRITY begins with each of us... choose wisely.